At Legal Expert the panel of expert legal solicitors we work with from across the country are able to work with claimants on a no win no fee basis. We have helped people to recover the personal injury compensation that they are entitled to after they have suffered an injury such as a broken knuckle. If you, a friend or family member have been injured as a result of an accident which was not your fault, talk to the specialists at Legal Expert today. In this personal injury case study example, a yardsman was awarded a total of £4,100 after suffering from a broken knuckle as a result of a crush injury. The claimant chose to make a personal injury claim for their injuries and spoke to a no win no fee solicitor. Solicitors which acted on their behalf sent a claim letter to the defendants’ employers. This was then passed on to the employer’s insurance company. Whilst many cases can be settled between the defendant and claimant, in this instance the case had to go to court to be settled, resulting in a broken knuckle claim. Hand fractures, such as broken knuckles, can take several weeks or a few months from which to heal. Most hand fractures, such has broken knuckles, will heal well. Typically after the broken knuckle has healed it may look a little different when compared to those on your other fingers. You may also find that a healed broken knuckle may move differently to the others when you open and close your hand. The claimant worked as a yardsman in a recycling plant where they unloaded skips with colleagues. The injuries occurred when they and two others attempted to re-load a large tree base, this should not have been admitted on to the recycling site. The claimant’s hand became trapped between the tree base and the edge of the skip as it was being lifted. This resulted in a crush injury to the claimants left index finger knuckle. The claimant chose to make a personal injury compensation claim for his injuries and contacted a specialist no win no fee solicitor who handled his case. They sent an initial letter to the claimants’ employer which was subsequently passed on to their insurance company. Solicitors acting on behalf of the defendant’s insurer initially denied liability for the accident. They alleged that the claimants’ supervisor could not remember the accident. The claimant subsequently provided a witness statement detailing what happened and the injuries sustained. The witness statement also included supporting evidence that the claimants’ supervisor was present during the injury and that the claimant went to a hospital with a colleague directly after the accident. Solicitors alleged that this would not be the case if there was no accident. The claimant also supported their claim with photos of the accident site. Solicitors acting on their behalf requested a copy of the companies accident book as well as medical records. The defendant refused to provide the accident records. The solicitors issued court proceedings, assembling a collection of supporting evidence to support the claim. Solicitors showed that there was a record of the claimant being absent from work for a hospital visit on that day during working hours. They also further supported the claim with supplementary evidence from an independent medical examination. This included the circumstances which were likely to have caused it, as well as the long-term prognosis for the injury. This confirmed the crush injury and the broken knuckle. It also showed how long it may take to recover from. As the defendant continued to contest liability, the solicitors for the claimant sent a notice to admit facts. The defendants’ solicitors recognised that the claimant had visited the hospital on that day and that they had not been disciplined for leaving work during the day. They also claimed that they were unaware of this until the case was brought up. Solicitors acting on behalf of the claimant organised a conference with a barrister to further investigate the case. However, on the day the conference was due to take place, solicitors acting on behalf of the defendant offered to settle the case without further court action. The defendant made a settlement offer which was considered to be at the lower end of the award spectrum for this type of injury. The claimants’ solicitors then negotiated with the defendants’ solicitors. In the end, solicitors for the claimant settled the case for an award of £4,200. This was made up of both special damages, for costs incurred and sundry expenses, as well as general damages for the actual broken knuckle injury suffered. The claimant was happy with the amount secured by the solicitor acting on their behalf. At Legal Expert, we connect people who have had an accident which was not their fault with one of our panel of specialist legal solicitors. They can work with claimants on a no win no fee basis. This type of agreement, also often known as a conditional fee agreement, means that whatever the claimants’ situation, if they have a valid claim they will be able to try and recover the compensation they deserve. Conditional fee agreements were designed to remove any upfront charges as well as ongoing fees that people may have to pay, and which may deter those who cannot afford them. No win no fee contracts often stipulate that if the solicitor cannot recover damages for the claimant, they will not charge any kind of fee. If the solicitor does recover damages for the claimant, they will take their fee from this. By law, the solicitor cannot take more than 25% of the total award as their fee. Using a no win no fee solicitors service helps to prevent any financial hardships which could happen as a result of making a claim. At the heat of what we do at Legal Expert, we believe it is important to help a claimant spend as much time as possible resting and recovering. That’s why we work to take the strain and handle as much of the legal side of things as possible. You can then rest assured that your claim is being worked on by dedicated professionals. Contact us today to speak to the specialist professionals at Legal Expert and start making your compensation claim for a broken knuckle or another personal injury claim. 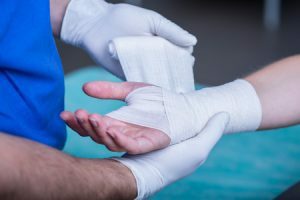 You can find out more information on hand injuries as well as making hand injury claims by calling Legal Expert today. Call us on 0800 073 8804, or email us about your case Info@legalexpert.co.uk. You can also get in touch with us by filling in our online contact form. View our guide to hand injuries and see how much hand injury compensation amounts that you may be entitled to. Find out how much compensation for a hand injury at work you could be entitled to by viewing our guide here.